Winning is when you’ve given it all you’ve got, and it comes from the heart. You can never lose regardless of what the score reads. At the Far Western Qualifiers in Reno, our 14 White won their division and won Far Western Champion t-shirts! 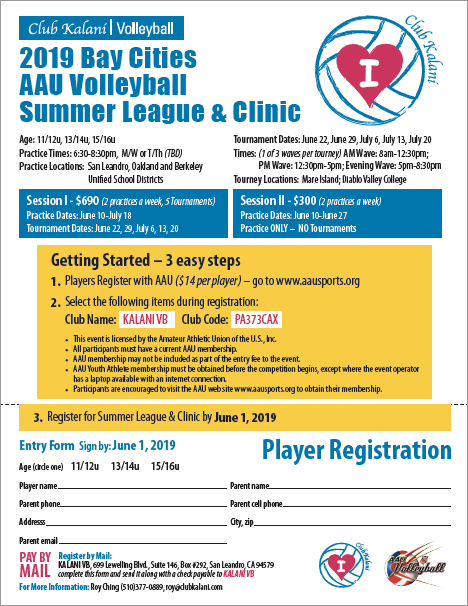 Sign-up for the Summer League and Clinic by June 1, 2019. Visit your team page for rosters, scheulde and tournament results. ... from players and parents. "Club Kalani is like a family. You are a part of a team, but it is so much more than that. Everyone takes care of each other. The coaches provide excellent training and take the time to work with you to spend time on skills, while teaching positive sportsmanship. For the girls, they develop a confidence in themselves both on and off the court because they learn to play and work together. Club Kalani is where I learned how to play volleyball, but also where I learned how to treat others with respect and kindness. Thank you Club Kalani! " – Julia D.
Click on any event above for more details.